GUNNISON—The Manti Templars took first place and went home with the Golden Shovel, a traveling trophy, in the second annual Spirit Bowl (also known as the Clash of the Colors) Jan. 21 at Gunnison Valley High School. The North Sevier Wolves took second in the event, while the North Sanpete Hawks were third, and the Gunnison Bulldogs took fourth. But if the schools had been scored based on the volume and enthusiasm of their cheering, the Spirit Bowl probably would have been a three-way tie. 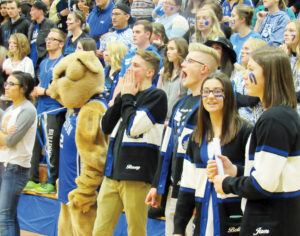 With student body officers and costumed school mascots standing on the gym floor in front of the various sections to lead cheers, students clapped, screamed, and jumped up and down nearly every time a school name was announced. Students even cheered when their school took last place in one of the competitions. 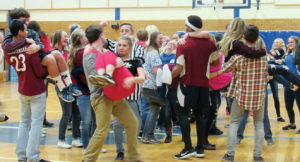 The Spirit Bowl started about a year ago when the student body presidents at Gunnison, North Sevier and Manti met to discuss creating an event that would promote friendships between students at the rival schools and promote school spirit. The first Spirit Bowl was held Jan. 23, 2016. The student body officers weren’t sure anybody would show up. But students from the three schools filled the Gunnison High School gym. That motivated student officers to replay the competition this year, including inviting a fourth school, North Sanpete, to take part. As in 2016, J.D. Fox of Sky 93.7 FM served as master of ceremonies, and at times, an informal referee. One of the competitions was the toilet plunger race. Students lay on their bellies with toilet plungers in both hands. They got the plungers to suction to the floor, pulled themselves forward, placed the plungers a little further down the course and pulled forward again. One competitor got in a fix when the stick pulled out of the middle of one of his plunger and he couldn’t get the stick back into the plunger again. Then there was “bungee basketball.” Opposing competitors were attached, back to back, to opposite ends of a bungee cord. Each player tried to get close to and shoot baskets in the hoop at his or her end of the court. One player would dribble toward the basket, only to be pulled down to the ground and dragged on his seat in the opposite direction by the competitor on the opposite end of the cord. When Manti won the competition, the Templar student body went wild. Another event was “cup stacking.” The goal was to build a perfect pyramid with plastic cups—and then to take the pyramid down, cup by cup. This competition was basically a relay race. A competitor from one school placed a cup, ran to the other end of the gym and tagged a teammate. That teammate ran to the center of the gym and tried to place another cup. It was a lot harder than it sounds, and in fact, harder that it looked. All of the schools accidentally knocked down at least one of their pyramid structures and had to start over. Gunnison, which had come in fourth in some other events, won this one. The Bulldog student body cheered and waved streamers. The Golden Shovel, the trophy that will go to the Spirit Bowl winner each year, is actually a snow shovel spray painted gold. J.D. Fox of Sky 93.7 (Mid-Utah Radio Group) helps students of Manti and Gunnison Valley get hooked up to opposite ends of a bungee cord for the bungee basketball event. 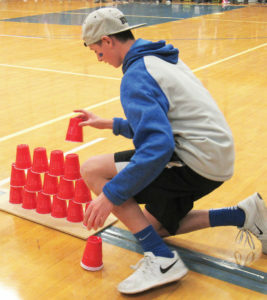 Gunnison Valley High student gingerly places a plastic cup to help form a pyramid in the cup-staking competition during the Spirit Bowl. Gunnison Valley won the event. In one competition in the Spirit Bowl known as Lover’s Leap, competitors, on signal, had to pick up and hold their partners in their arms.